Trying to find commercial multi-panel table tents to present numerous pieces of promotional content in a single marketing tool? The acrylic frames allow managers and merchants at least a couple opportunities to attract clientele with bright graphics and important messages. 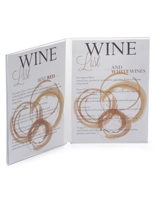 Tabletop menu fixtures can prove to be very effective when properly installed with color printings or visually appealing signage. 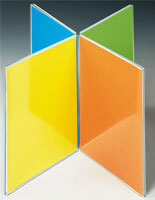 Acrylic displays come in bi-fold, spindle, triangle and rectangle designs that will stand tall on counters and tables. Restaurant managers, retail store merchants and people promoting goods can easily slide the cards into the fixtures to maximize advertising efforts. 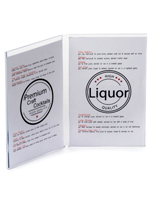 These multi-panel table tents with the clear plastic construction, commonly referred to as multiple frame sign holders, are designed to accommodate anywhere from two to eight promotions at one time. The acrylic frames come in different sizes to present the ads to patrons at a restaurant, store, school or other facility. 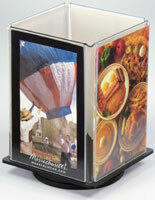 Tabletop fixtures are a great place to showcase menu additions and specials. 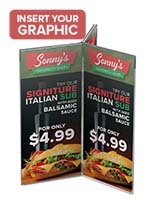 These multi-panel table tents are transparent acrylic frames that allow pictures with bright colors to stand out on the counter or other flat surface. The multiple frame sign holders are large enough to present eye-catching prints, but small enough to leave plenty of room on the tabletop or check-out counter. 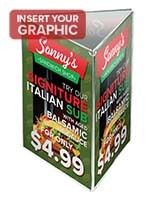 Many of the accessories for a restaurant or store have double-sided designs to capture the attention of people on either side of the marketing solution. Wholesale tents are economically priced to provide users with a means of presenting more than one ad without breaking the budget. The multiple frame sign holders have a lightweight construction, but will protect the messages from dust, dirt and other elements. The tents can withstand the normal wear and tear associated with use on tabletops, countertops and shelving. Acrylic frames may be used on any flat surface that receives notice from patrons. What designs do the multiple frame sign holders come in? 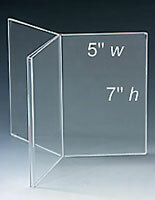 These acrylic multi-panel table tents feature different shapes and styles to present all of the necessary content. 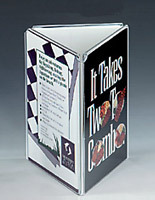 Tabletop menu fixtures are available in a simple bi-fold construction to showcase full color cards side by side. The traditional design elegantly presents the two advertisements. 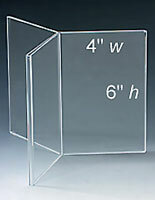 Spindle acrylic frames have three or four frameworks projecting from a central vortex. 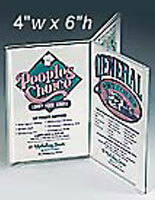 Managers and other promoters use these menu cases to show off up to eight color images. The extending paneling provides stability on counters and other flat surfaces. 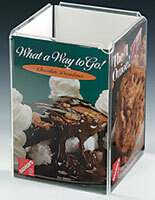 Tabletop menu holders are also available with closed shaped designs. Advertisers can elect to setup a triangle or rectangle fixture on the counter, shelf or cash wrap. The three or four sided constructions provide plenty of space for promoting goods or services. 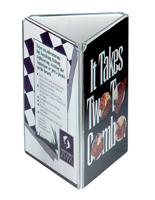 These multi-panel table supplies come in different sizes to adequately present the printed materials. 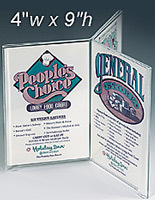 The countertop acrylic frames are available with a 4" x 6", 5" x 7" or 4" x 9" space for menu cards. 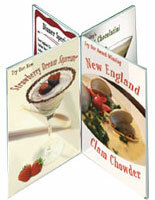 The restaurant supplies even accommodate 8.5"w x 11" flyers and prints. 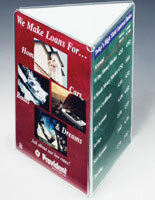 Each of the acrylic displays have a fold over construction for easily loading the color ads. Choose a spindle, triangle, rectangle or bi-fold display to generate buzz about goods and services.